From August 2 to August 4, the East Village’s Empire Biscuit will transform into what sounds like some kind of comedy heaven, where comics you’ve seen on TV will perform from just feet away while you stuff your face with one of the restaurant’s delicious biscuits, included with the price of admission. The Empire Biscuit Comedy Festival will feature more than 40 comedians in nine shows Sunday, Monday and Tuesday. Given the takeout joint’s tiny size, this should be a great chance to see big names like Sasheer Zamata of SNL and Mike Lawrence (who just opened for Marc Maron) in an (all too?) intimate setting. Sure, you could trek out to Jones Beach to see Aziz Ansari and Amy Schumer headline the Oddball Comedy & Curiosity Festival in September, but that’s a big production. Instead, walk on over to a couple of lower-key comedy fests happening in the next couple of weeks. This Shack Will Serve You Lobster-Topped French Fries at 1 A.M.
A new food stand sells poutine that’s anything but routine: when it opens in Bushwick today, The Diggs will be topping fries with everything from lobster to smoked tempeh. 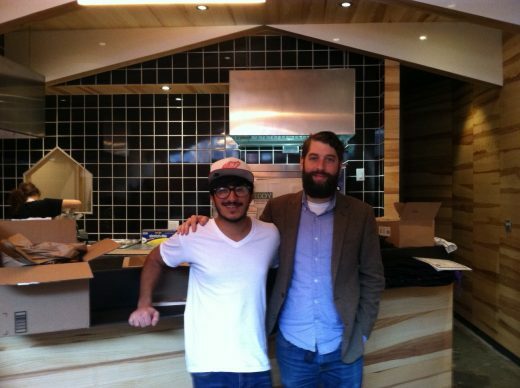 Tsuna and Price as they prepare for their reopening. Earlier this week, Empire Biscuit opened at 198 Avenue A, near East 12th Street, and began peddling biscuits in every imaginable form (as a sandwich, slathered in gravy, or topped with an impossibly eclectic selection of spreads and jams); the demand was so great that owners Jonathan Price and Yonadav Tsuna ran out of major menu items and had to close early. They’re taking the weekend to regroup, but come this Tuesday, with an expanded staff and a bolstered inventory, they’ll officially be open 24 hours a day.